Sometimes we may wish to hijack the space bar so that when we use it to GO we can execute some other actions in addition to the normal GO command. This might include logging a timestamp for the go, or some custom cue list behavior. In this example, we are going to create a behavior that skips disarmed cues in a simple linear cue list. Q16 in this workspace is quite interesting. It doesn’t play the auto continue from the disarmed cue. This might or might not be what you want. It’s worth noting that in anything other than the most simple workspaces there may be similar cue structures that can be programmed where the cue list may not behave quite as you expect or want it to, particularly with auto continues and auto follows and complex groups. In a second cue list, a fire all group cue is added. This is triggered by the space bar (or any MIDI triggers you set to use). It first clears the existing video output. 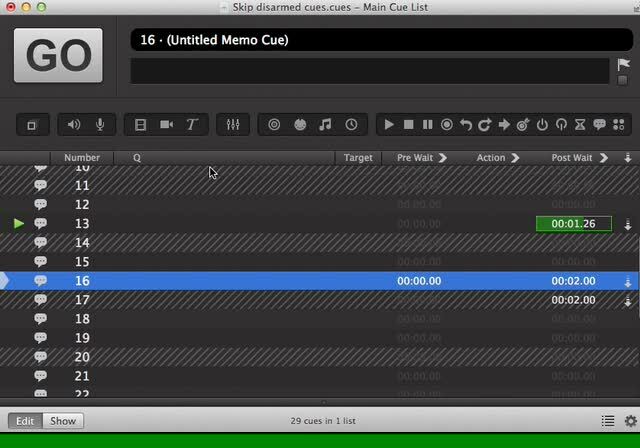 The messages between the hash symbols in the OSC tells QLab to get that information from the selected cue (which will be the cue about to be fired). The cue is then fired with an OSC /go message, which then means that the selected cue will be the cue standing by to be triggered.